A relationship is born. The so-christened ‘Devlin poem’ is first of a series of lyrics that celebrate their ties, recognising Marie’s place in Heaney’s development as a poet. His title invites us to complete the idiom ‘once bitten … twice shy’: those who have been hurt are doubly careful the next time round (especially in matters of love). Heaney describes a walk (perhaps their very first) with the woman who was to become his wife and to whom he had been married for nearly fifty years when he died in 2013. They met during their University days. The speaker is walking along the riverside with a woman he finds both sensationally attractive (Her scarf á la Bardot) yet sensible and practical (suede flats for the walk). Behind the pretext for their stroll, for air and friendly talk, an emotional drama is in preparation. Their mutual ‘chemistry’ has generated suspense all round: on the ground Traffic holding its breath; in the air Sky a tense diaphragm. Nightfall has provided a setting sensitive to the slightest variation (a backcloth/ That shook where a swan swam) and the thrilling physical pull he feels has transformed him into predator stalking prey: Tremulous as a hawk/ Hanging deadly, calm. A breath-stopping impulse urged the couple to fall into each other’s arms (A vacuum of need/ collapsed each hunting heart) but they accepted joint responsibility for timing and on this first walk resisted the thrilling pull of ‘gravity’ (tremulously we held/ As hawk and prey apart), retained a respectable distance and changed the subject (Preserved classic decorum,/ Deployed our talk with art). Heaney attributes their caution to youthful experience (juvenilia), when early relationships were declared too hastily (publish feeling) and rued at length (regret it all too late), when extreme feelings were generated: Mushroom loves already/ Had puffed and burst in hate. So for the moment at least the face-off between caution (chary) and pleasure (excited ) protects the prey (a thrush linked on a hawk) restricting them to the thrill of the March twilight and nervous childish talk. Heaney weds moment and place via a forecast that will prove true: Still water running deep. 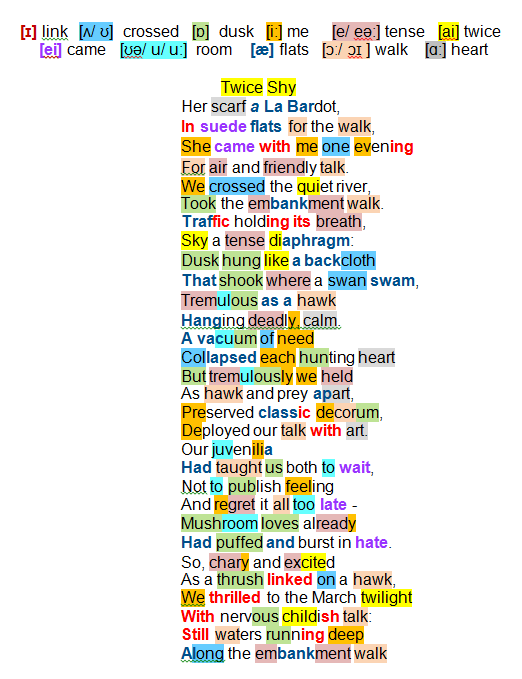 Insights are offered into both Seamus Heaney’s and Marie Devlin’s personalities within the inhibiting, repressive sexual mores of the time; overlapping relationships could get in the way, too: questioned about mushroom loves leading to hate (DOD45) Heaney felt that his need to find a rhyme had led to him overstate the situation. He talks rather of the ever painful business of disentangling required when one meets the love of one’s life!